It looks like “The Lone Cypress” in California. Today it was very warm and beautiful day in Shimoda!! That’s why our guests went to the beach to swim. Before goint to Shimoda town for shopping I took this picture. I could see a gorgeous beach like this after long time. I am showing one more picture for you…. 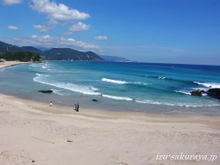 This entry was posted in beach on 2007年10月22日 by izusakuraya. Today it was a little sunny early this morning but after that the weather was change, it was almost cloudy all day. The color of the ocean is really different depending on the weather. 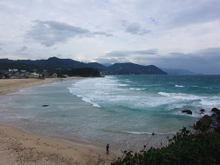 Today’s Shirahama beach had gray ocean like this picture. And we had very strong wind from the north….. This entry was posted in Sea on 2007年10月16日 by izusakuraya. Every year we clean up all spaces in our building after summer, and we started to clean up the dining room today. 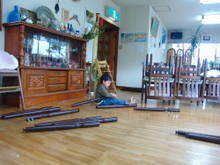 We have to move everything out of dining room to clean up, so it is very hard to do it. I think it takes 2 or 3 days to finsh, but our guest will be able to have meals in beautiful dining room after that. This entry was posted in Pension Sakuraya on 2007年10月9日 by izusakuraya. Big Wave in Shirahama Beach !! "We had big wave today!" As our guest told me I went to the beach to take pictures with my son. 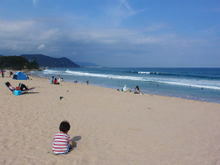 This entry was posted in beach on 2007年10月7日 by izusakuraya.